The all-new, patented BetaGauge 330 is a true first, offering full comound pressure/vacuum measurement, electrical calibration, temperature measurement and self-contained precision electirc pumping, allowing the operator to place the device on a surface and do his or her work without having to operate a manual pump. Accuracy of 0.025%FS is outstanding and the device can accept external pressure sensors to extend its built-in broad ranges. 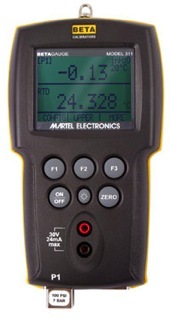 The Model 321 Advanced Pressure Calibrator is a general purpose, high accuracy pressure calibrator with special features intended to facilitate calibration of mass flow computers. With one internal pressure range and an available adapter for external BetaPort-P pressure modules, the possibilities are extensive. In addition, the advanced pressure calibrator has a port to connect a precision RTD probe for the temperature factor calibration required for electronic flow meters (EFMs). Dual sensor, triple display temperature pressure calibrator. The new standard of custody transfer applications. The Modular Pressure Calibrator is unmatched by any device in its price range. For the majority of its available ranges, it has a typical pressure accuracy of 0.025% fullscale and an electrical accuracy of ± 0.01%. That makes it four times more precise than the instruments it is used to calibrate, including 0.10% accuracy smart pressure transmitters. Even so, the modular pressure calibrator is priced competitively, with other pressure calibrators. The closest pressure calibration devices more accurate are far more expensive - lab instruments not intended for field use, such as quartz gauges used to calibrate other calibrators. Yet, remarkably, best of class accuracy is but one of the many reasons for specifying the modular pressure calibrator. Call us today at 480-947-9003 for a FREE catalog on CD.